Credit: Loktev and Lindner et al. RESTON, VA – A new nuclear medicine imaging method could help diagnose widespread tumors, such as breast, colon, pancreas, lung and head and neck cancer better than current methods, with less inconvenience to patients and with equal or improved accuracy. The study is featured in the September issue of The Journal of Nuclear Medicine. The new imaging method, developed by a team of German researchers, targets cancer-associated fibroblasts, a subpopulation of tumor stroma cells (connective tissue cells). These fibroblasts are an attractive target for diagnostic imaging and therapy, as they are present in more than 90 percent of epithelial carcinomas, including pancreatic, colon and breast cancer. Cancer-associated fibroblasts (CAFs) have a high expression of fibroblast activation protein (FAP) and are known to be involved in tumor growth, migration and progression. They are also genetically more stable than cancer cells, making them less susceptible to developing therapy resistance. "The appearance of FAP in CAFs in many epithelial tumors and the fact that overexpression is associated with a worse prognosis led to the hypothesis that FAP activity is involved in cancer development, as well as in cancer cell migration and spread," said Uwe Haberkorn, MD, professor of nuclear medicine at the University Hospital of Heidelberg and at the German Cancer Research Center. "Therefore, the targeting of this enzyme for imaging and endoradiotherapy can be considered as a promising strategy for the detection and treatment of malignant tumors." Based on an FAP-specific enzyme inhibitor (FAPI), the team developed the positron emission tomography (PET) tracer gallium-68 (68Ga)-labeled FAPI, which was tested first on mouse models then through proof-of-concept PET/CT imaging of three patients. The results showed high tracer uptake by the tumors and fast body clearance, resulting in high?contrast images and very low binding to healthy tissue in both animals and tumor patients. Haberkorn pointed out, "A comparison to fluorodeoxyglucose [18F-FDG]–the common standard in tumor imaging–revealed a clear advantage of our tracer with regard to tumor uptake and image contrast in many tumors." 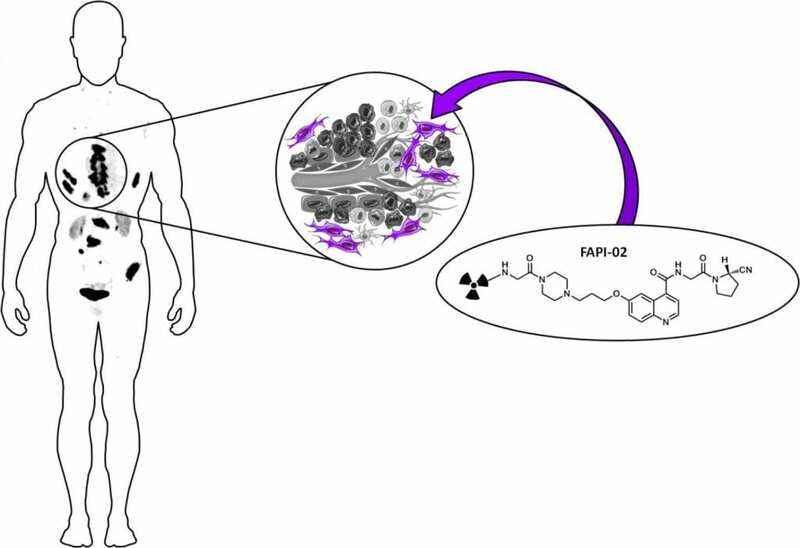 The fact that radiolabeled FAPIs allow fast imaging with very high contrast in tumors that have a high stromal content makes them versatile, pan-tumor agents. These molecules can be coupled to DOTA or other chelators, allowing labeling not only with 68Ga, but also with therapeutic isotopes such as lutetium-177 (177Lu) or yttrium-90 (90Y). As the FAPI tracers contain the universal DOTA-chelator, a theranostic approach also seems feasible. This study was made available online in April 2018 ahead of final publication in print on Sept. 1, 2018. Authors of "A New Method for Tumor Imaging by Targeting Cancer Associated Fibroblasts" include Anastasia Loktev, University Hospital Heidelberg, German Cancer Research Center (DKFZ), and Heidelberg University, Heidelberg, Germany; Thomas Lindner, Walter Mier, Frederik Giesel, and Clemens Kratochwil, University Hospital Heidelberg; Jürgen Debus and Annette Altmann, University Hospital Heidelberg and DKFZ; Dirk Jäger, National Center for Tumor Diseases (NCT), Heidelberg, Germany; Philippe Barthe and Christian Roumestand, Université de Montpellier, Montpellier, France; and Uwe Haberkorn, University Hospital Heidelberg, DKFZ, and German Center for Lung Research (DZL), Heidelberg, Germany. Please visit the SNMMI Media Center to view the PDF of the study, including images, and more information about molecular imaging and personalized medicine. To schedule an interview with the researchers, please contact Sarah Schlieder at (703) 652-6773 or [email protected] Current and past issues of The Journal of Nuclear Medicine can be found online at http://jnm.snmjournals.org.